Found as the THREE FARMERS 1760 & 1763. Location then given as Castle Hill. Address as Castle Ditches 1822 & 1830. All the Household Furniture and other Effects of James Barber were offered for sale by auction Thursday 18th January 1838 since he was leaving the Inn. On 4th November 1839, the Insolvent Debtor, James Barber, was described as, formerly of Fisher's Lane, Ostler, then of Fishergate., Licensed Victualler and Common Brewer (New Brewery), afterwards of the Castle Ditches, Innkeeper and Dealer in Corn, Hay and Straw, then of Long Stratton, out of business, then of Bury St. Edmund's, out of business, then of Swaffham, out of business, then of Hackford next Reepham, Ostler and late of Kings Lynn, Ostler. For Sale by Auction Wednesday 22nd March 1848 upon the instructions of the Proprietor, Mr. Moore. Decidedly the most Preferable Situation of any house in the locality. As a Market Hose it stands pre-eminent, next the Weighing machine. Comprising Cellarage a Bar, equal or superior to any in the City, Porter and Tap Rooms, Parlour, kitchen, Dining, Sitting and several Bed Rooms. Spacious Yards and Stabling for 50 Horses, roomy Lofts, Gig-houses, Granary and other convenience. Existing Lease to expire 25th March 1849. Robert Powley, of the Jolly Farmers, Castle Ditches, informed his Friends and the Public, 14th July 1849, that he intended erecting a Booth on his Ground opposite the Shepherd's House, Mile End Road, near the Agricultural Show Ground, for Refreshments and to give accommodation for Horses and carriages. John Clements (26) was Ostler here in July 1859. He was accused of inducing William Boughen, assistant at the weighbridge (on the hill) to issue false weigh-tickets. In conspiracy with haytrusser, George Gooch (25) they had sought to defraud Cawston farmer Edward Bird of hay to the value of £3 6s. Boughen admitted issuing false tickets but did not implicate either Clements or Gooch, so they were acquitted. Offered To Let September 1873 in consequence of the retirement from Business of the Widow of the late Mr. Robert Powley, who had occupied the house for twenty-five years. On 31st January 1874, John Goldthorpe informed His Friends and the Public generally, that he had opened the old-established Inn after undertaking many necessary alterations and improvements. He offered Wines, Spirits, Ales and Stout of superior quality. Chops, Steaks, &c. at the shortest notice. 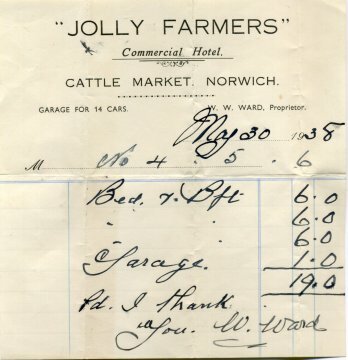 1938 invoice for accommodation at 6/- per room per night, including breakfast. A letter from Youngs, Crawshay & Youngs dated 05.04.1944 states intent to recommence trading from 06.04.1944. Closed 01.03.1962 according to Bullards records. However Bullards advised the Magistrates by letter dated Wednesday 1st March 1962 that the house had closed "Sunday last".